If they do, you must be a fan of the Food Network and the fan favorite show, Chopped. I’ve been a Food Network fan for years and have dreamed of saying those words. The thrill of opening that basket full of crazy ingredients. The panic of trying to figure out what to create and the nail biter at the end… Who’s plate is on the chopping block? You can forget extreme sports or bungee jumping for me, my thrill seeking experience would be on the set of Chopped! When the folks at Chopped and Sargento came to me and asked if I would participate in Round Two of the At Home Chopped Challenge… You know I was thrilled to participate! This round, the theme is Mexican. What’s in the basket you ask? 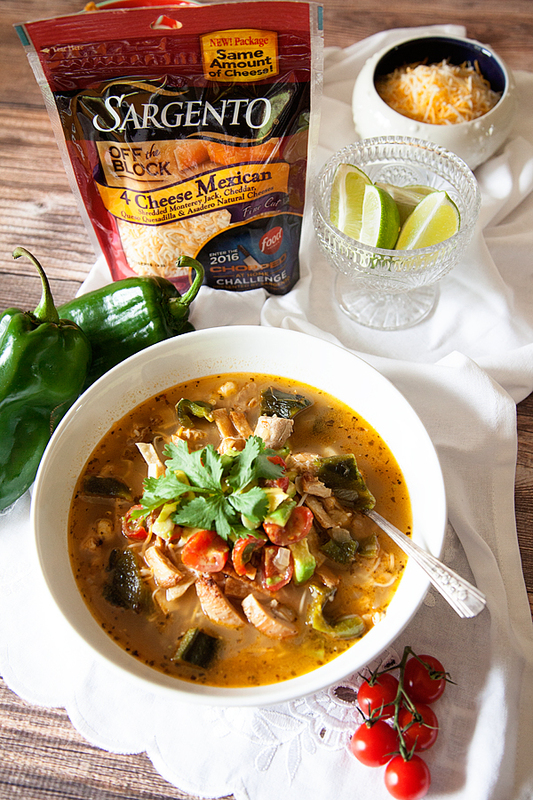 When I saw those ingredients, Sargento® 4 Cheese Mexican Blend, chicken thighs, Poblano peppers and corn tortillas, my first thought was tortilla soup. One of my favorite soups of all times is Tortilla Soup. However, that can mean a million different things to different people. I have had at least 25 different variations on Tortilla Soup. Some have a tomato broth base while others have a lovely chicken broth base full of spices. 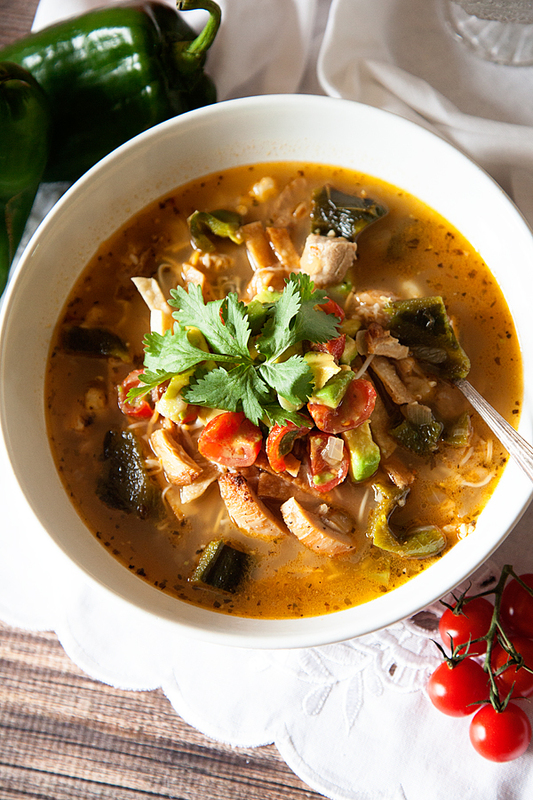 It can be packed full of veggies or just broth, chicken and tortillas. Some have been topped with all kinds of great garnishes like avocados, tomatoes, sour cream and the like. I decided it was high time for me to try my hand at creating my very own tortilla soup recipe and this was the perfect opportunity! 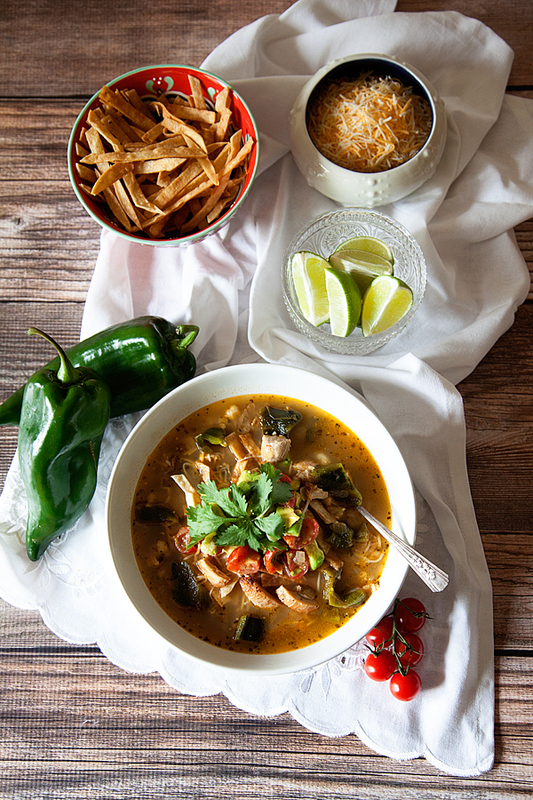 A beautiful take on the classic Tortilla Soup perfect for any occasion. In a large heavy bottomed pan heat 1 tablespoon of olive oil over medium high heat. Season chicken thighs with salt and pepper and place in the hot pan. Turn down the heat to medium. Cook the chicken on one side for 4-5 minutes or until nicely browned. Turn and place in the oven for another 15 minutes. Remove from oven and set-aside. In a dry cast-iron or heavy pan, place the Poblano pepper over high heat. Let the skin blister and blacken on all sides. Remove the peppers from the pan and place in a bowl and cover with plastic wrap, let cool for 10 minutes then gently pull the charred skin off and discard. Cut peppers into large bite-sized pieces and set aside. In a large pot over medium heat, add 1 tablespoon olive oil and the chopped onion. Cook for 3-4 minutes and add garlic cook for another minute. Add the cumin, oregano, chili flakes and Harissa powder and cook for another minute. Add chicken stock and bring the up the temperature to medium high and let stock simmer for 20 minutes. Clean-up the chicken thighs by removing from bones and remove any remaining fat. Chop or shred into bite-size pieces. In a medium cast iron or heavy bottomed pan over medium high heat, add your vegetable oil. Cut corn tortillas into thin strips and add to the hot oil in small batches. Cook for 1-2 minutes until they start to turn a light brown. Serve soup hot with a nice layer of Sargento® shredded 4 Cheese Mexican Blend topped with tortilla strips and the tomato & avocado salsa. Now of course you can add all kinds of cilantro if you’d like as well. We aren’t big cilantro fans at our house so I tend to leave that out, but it’s totally up to you and your taste. You know what’s super cool! YOU can enter the Chopped At Home Challenge for a chance to WIN $10,000 + a Trip to New York to have a private cooking lesson at the Food Network Kitchens. Ummmm, sign me up! That’s the coolest prize EVER!! All you need to do is Submit your recipe to FoodNetwork.com/ChoppedChallenge for the chance to win $5,000 and a trip to New York City to compete in a televised Chopped cooking challenge for a $10,000 grand prize.